The Washington State Basic Food Employment and Training (BFET) program provides employment readiness opportunities to Basic Food (SNAP) recipients who are not participating in the Temporary Assistance for Needy Families (TANF) WorkFirst program. Services are provided through contracted community & technical colleges and/or community based organizations (CBO). You can find a list of our community based organizations here and our college providers here. BFET is an important part of the state’s comprehensive workforce development system, helping low-income individuals, displaced workers, and employers reach their human potential by encouraging economic well-being through skill acquisition, personal responsibility and gainful employment. As of Federal Fiscal Year (FFY 2019), BFET collaborates with 56 CBOs, and 33 community and technical colleges that are part of the State board for Community and Technical Colleges (SBCTC) statewide. Strategies for Success / Life skills: A class that helps teach abilities for adaptive and positive behavior that enable you to deal effectively with the demands and challenges of everyday life. Please note not all agencies provide all of these services. Many agencies partner with other agencies to provide better opportunities for participants to reach their full potential. Since BFET began in 2005, more than 89,448 individuals receiving food benefits have participated in employment training and support services through BFET. The program has brought in over $40 million to local non-profits and Community & Technical Colleges to deliver program specific services to Basic Food recipients. Based on demographical data, 60% percent of BFET participants became employed at a median hourly wage of $14.44 per hour as of Quarter 1 of 2017! BFET services are unique to each organization, there are differences between what a client will receive based on the contracted organization. BFET Community Based Organizations (also known as CBOs) are contracted agencies across Washington State offering unique comprehensive employment and training services, including guided job search, job training that enhances resumes and interview skills, vocational training, general education including GED, Adult Basic Education, and various certification programs. What’s great about these services is each agency offers unique services tailored to the community and individual. They understand community needs and the employment and training options that effectively contribute to their neighborhoods. By offering unique and independent services, they are able to collaborate and co-enroll clients with other agencies, providing individuals full employment and training services. BFET agencies also co-enroll with BFET colleges. BFET community based organizations grow each year. Review our Community Based Organization section for a full list of current providers. 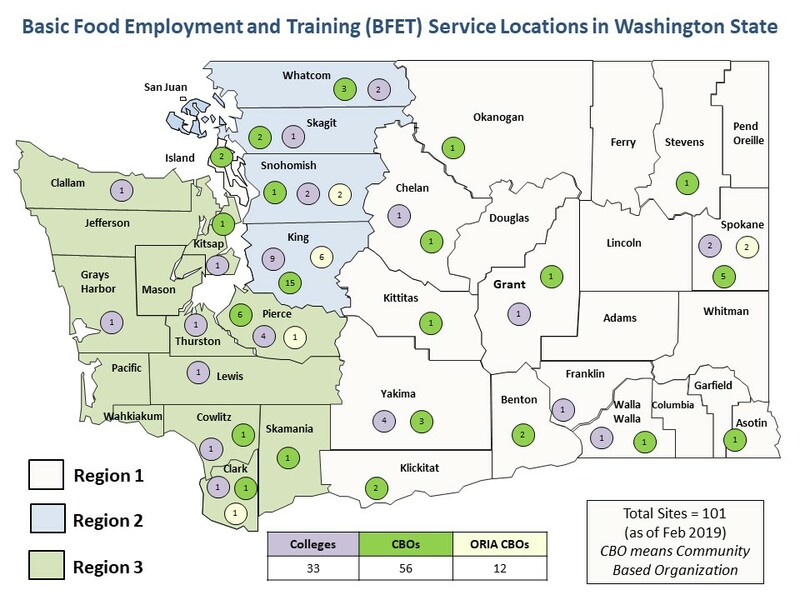 BFET partners with 33 of Washington Community and Technical Colleges to provide educational training such as Vocational Education, GED, High School Equivalency and Basic Skills. If you are enrolled at one of the colleges and receiving or eligible to receive food assistance you may be eligible to receive additional support through the college’s BFET program. As a student, you may be required to meet certain criteria in order to be eligible for Basic Food Assistance. BFET may help you meet that criteria. Being enrolled in BFET may help to meet student status rules as outlined in WAC 388-482-0005. (How does being a student of higher education impact my eligibility for the Washington Basic Food program? )For more information on how a client is eligible, please see the section regarding student eligibility. For a list of colleges that partner with BFET, please review our college provider section here. If you are a refugee and immigrant, you may also be eligible for BFET services through the Office of Refugee and Immigrant Assistance. Please click here to learn more information on eligibility and enrollment. See below for a brochure for each region.